Australia’s renewables boom: will Corporate PPAs be the next wave? the retirement announcement of one of Australia’s largest coal power stations, Victoria’s Hazelwood Power Station, in October 2016.
the need for electricity retailers to buy record volumes of Renewable Energy Certificates ahead of the looming end of the Renewable Energy Target in 2020 (and following an investment freeze for 3-years). A grant round by ARENA which stimulated the large scale solar market, development activity and a realisation that large scale solar farms had come down significantly in price. Competitive auctions for the Victorian Renewable Energy Target which have underwritten 1600 MW of large wind projects. Over 7,000 MW of large scale wind and solar projects are now under construction or have just commenced operating. Wind has long dominated large-scale renewable energy investment in Australia but the chart below shows large-solar is now attracting the majority of the new generation capacity – led by Queensland, NSW and even Victoria (alongside the new wind projects). Note: the graphs include some projects that have been completed and are now generating. Also, actual AC capacity of solar farms is always made public, and there may be additional projects not included as have not been made public. Wind farms generate more electricity per MW of capacity each year. The graph below shows the developments in annual generation terms for each state. In annual generation terms, the two stand-outs are Victorian wind (adding an additional 4,500 gigawatt-hours of annual generation to the Victorian market) and Queensland solar (adding an additional 3500 gigawatt-hours to the Queensland market). What will be the impact of this renewables boom on the consumption mix for each state? The graph below compares the new renewable generation to the annual consumption of each state. While NSW is making considerable investment in wind and solar, it has the largest market so this new investment will see it only become just over 5% more renewable. The recent Victorian renewable energy target auction results has seen Victoria overtake South Australia for new renewable energy generation (though SA still has a higher overall percentage of renewable energy); new solar projects will meet 4% of Victorian demand and new wind projects will meet around 10% of Victorian demand. In addition to the large-scale solar projects, 2017 was a record year with 1200 megawatts of on-site solar installed by Australian households and businesses – the massive uptake has continued in 2018 and may reach 1.5 Gigawatts in 2018. The main forces driving this renewables boom could peter out by 2020. The Clean Energy Regulator says there is now enough generation to meet the 2020 Renewable Energy Target and the current Federal Government has said it will not be expanded. The biggest sourceof demand for solar and wind farms – retailer PPAs – would continue but at a much lower rate. The second source of demand for solar and wind farms – the state-based targets – is now in the pipeline. Queensland is currently running a smaller auction for 400 megawatts. But there will still be a large number of renewable energy projects looking for a buyer for their power. 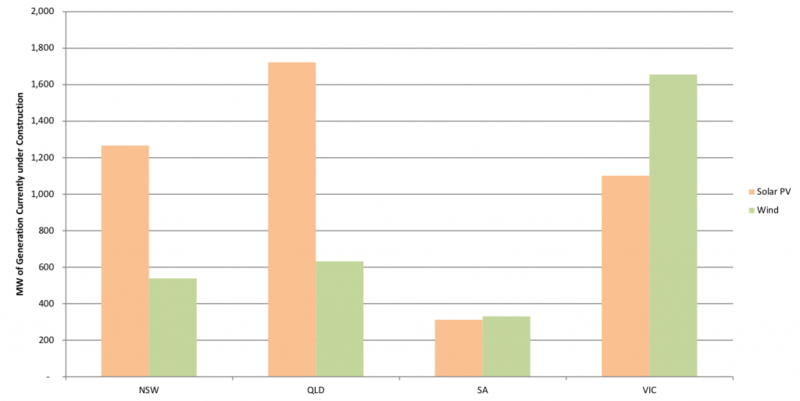 The Queensland auction for 400 megawatts attracted 15,000 megawatts of proposals. 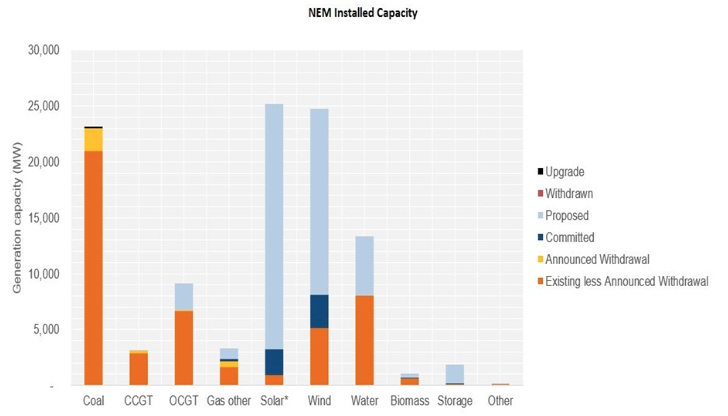 The Australian Energy Market Operator estimates there is still a whopping 35,000 megawatts of proposed large solar and wind projects (the light blue). A third source of demand for renewable energy projects has now emerged – Corporate Renewable Energy PPAs negotiated by public and private organisations. By signing longer-term deals with solar and wind farms, organisations can fix prices for a portion of their demand – reducing the cost, risk and carbon footprint of their electricity consumption. In the past 12-18 months, this new market segment for large-scale renewable energy has gathered pace with major organisations such as Telstra, Coca-Cola, ANZ, Carlton United Brewery, state and local governments and universities signing deals with solar and wind farms. However, most of the deals to date have been bespoke agreements negotiated by major energy users with high transaction costs. Energy is complex and many of the stakeholders that need to sign off on a RE PPA don’t have the knowledge and tools to do so. The challenge is to open up access to renewable energy PPAs by helping connect buyers and sellers, standardising agreements and reducing transaction costs, and improving understanding of how RE PPAs work amongst buyers and what buyers need to commit to RE PPAs amongst renewable energy project developers. The Business Renewables Centre Australia will be rolling out information guides, events, training courses in coming weeks and months – and writing further blogs on market developments and RE PPAs. We are a member-driven organisation. If there are any topics on PPAs, electricity markets or regulations that you would like us to cover please get in contact.